Jay Gruden is stuck in no man’s land, without any parachute or rescue team in sight. He’s bailed on Robert Griffin III, hitching his wagon to Kirk Cousins. 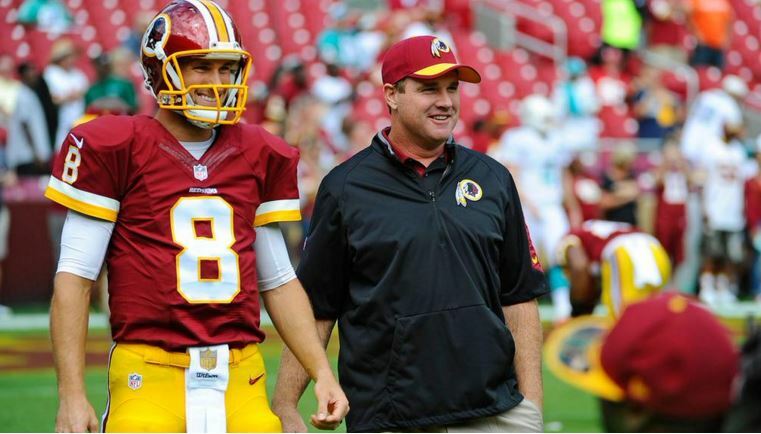 Cousins has been anything but good, leaving many to wonder if it’s time for Colt McCoy. Benching Cousins would expose Gruden to the wrath of GM Scot McCloughan, likely costing him his job. For the fourth time this season, Cousins threw two interceptions in a game, this time a 34-20 loss to the New York Jets on Sunday. Cousins now has eight picks in just six games. Afterwards, many in the media and those who analyze the game felt Gruden was making excuses for Cousins. Asked if Cousins was still the starter, Gruden said he’d have to assess the film, before finally stating that Kirk was his guy. “Yeah,” Gruden said. “That’s the intent. "Overall you hate to pin this game on Kirk. I know he could have played better, but we had no running game whatsoever and Kirk’s not in that stage of his career right now, nor is anybody on our roster, to carry our team throwing the ball as much as we had to.